1) "You must continually increase your learning, the way you think, and the way you approach the organization." 2) "It's been a long time since you could talk about sustainable competitive advantage. The cycles are shortened." 3) "If you want to improve the organization, you have to improve yourself and the organization gets pulled up with you." 4) "Most companies target women as end users, but few are effectively utilizing female employees when it comes to innovating for female consumers." 5) "There's constant reinvention: how you do business, how you deal with the customer." 6) "Sweating the details is more important than anything else." 7) "Be yourself. Never hide what makes you, you." 8) "I wouldn't ask anyone to do anything that I wouldn't do myself." 9) "Leadership is hard to define and good leadership even harder. But if you can get people to follow you to the ends of the earth, you are a great leader." 10) "When women are empowered in the design and innovation process, the likelihood of success in the marketplace improves." 11) "You cannot deliver value unless you anchor your company's values." 12) "To be a CEO is a calling. You should not do it because it is a job. It is a calling, and you have got to be involved in it with your head, heart and hands. Your heart has got to be in the job; you got to love what you do; it consumes you." Thank you for all of the great business quotes Indra Nooyi! 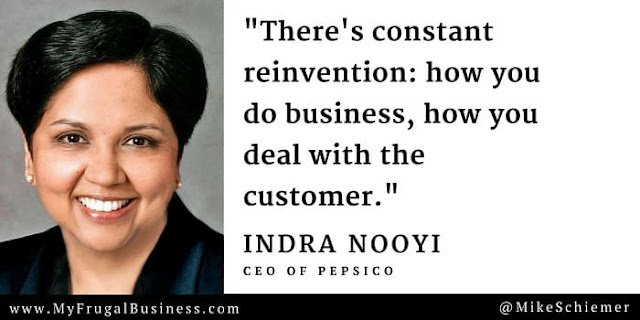 I hope you enjoyed this inspirational quote compilation from former Pepsi CEO Indra Nooyi and top leading woman in business. Interested in more motivational business quote compilations?